Mr. and Mrs. Liew are not your typical couple. Mr. Liew is a stroke survivor and is now wheelchair-bound, still on his way to recovery. Through it all, Mrs. Liew takes care of him without any complaint. But despite their tough circumstances, they still care about others. On their 25th wedding anniversary last year, Mr. and Mrs. Liew celebrated it by doing something different. Having heard about the #LoveOthers14 in their church, Heart of God Church, they decided to carry out their own #LoveOthers14 initiative! They have a friend, Mr. Ang. At 80, Mr. Ang is still working to support his family. Mr. and Mrs. Liew bought him and his family supermarket vouchers and food items so that they could help lighten some of his financial burden. 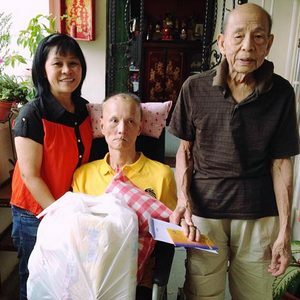 Despite Mr. Liew being on a wheelchair, the couple even went the extra mile to deliver these gifts to his house! They are a truly amazing couple!